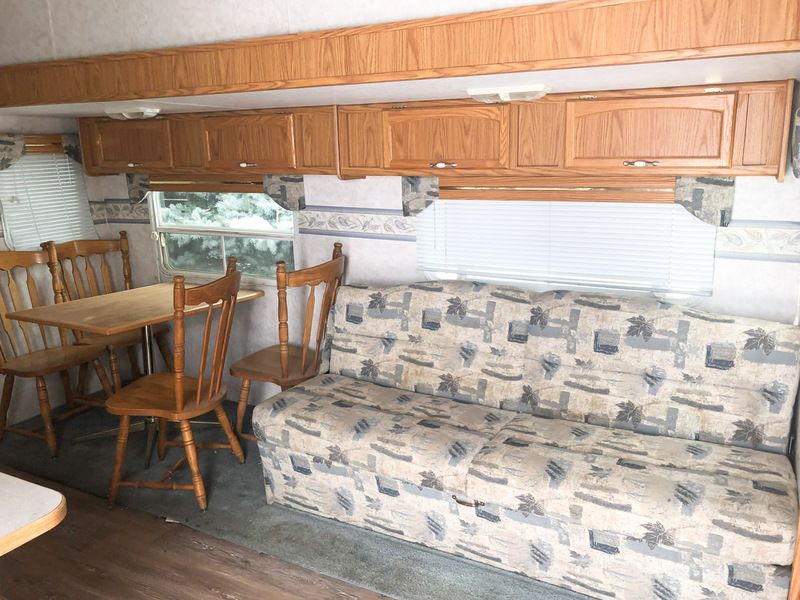 Sharing the “before” state of our new-to-us RV, and explaining why we got it, what we plan to do with it, and introducing our next DIY adventure! This adventure is something we only ever joked about doing and I still can’t believe I am open to the idea. Let me tell you all about it, and I’ll let you determine if we are crazy, or brave. 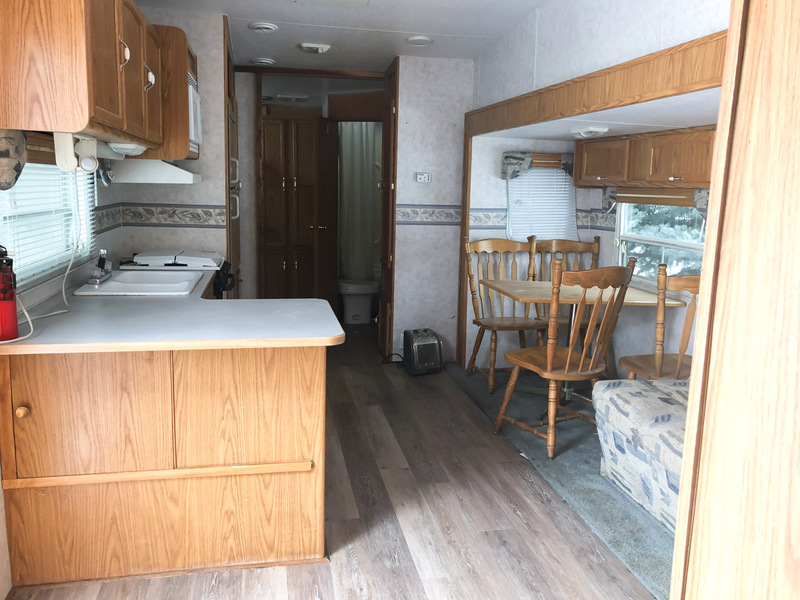 I’m sharing this post in video or you can continue to read all about our adventure and see our RV/camper/trailer in all it’s “before” glory. 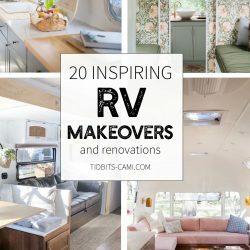 All the RV makeover inspiration I gathered can be found on my post “20 Inspiring RV Makeovers” where you will also find all the sources to the images I shared. I recently just spilled the whole can of beans for our big dreams for our 25 acres of property. I still can’t read through all the comments on the post without tearing up. Thank you everyone for your support. In that video, I discussed the phases we will take for building up to our dream. Phase 1 was important for us to be able to rid ourselves of expensive rent payments, which to us feels like money we will never get back. So we shared how we will first be building a pole barn that we will convert into a home, saving us a significant amount of money when compared to building a home. I’m excited to take you all through that process and tell you more about it soon. But as it is turning out, phase 1 is going to entail a little more than what we had initially thought. So let’s just call it Phase 1a and Phase 1b. While I would love to skip right to phase 1b, the pole barn, the reality is that it won’t even have begun to be built before our rental home lease is completed at the end of March. We hoped time would have been more on our side, but we did gear ourselves up for the reality that all the permits we have to get on undeveloped county land would take some time and perseverance. So what is a homeless family of 6 to do? Move in with mom?? Out of the question (her words, not mine). Extend our lease? Sure, but we are all about pinching pennies right now and an extension would mean more commitment and higher rent cost. 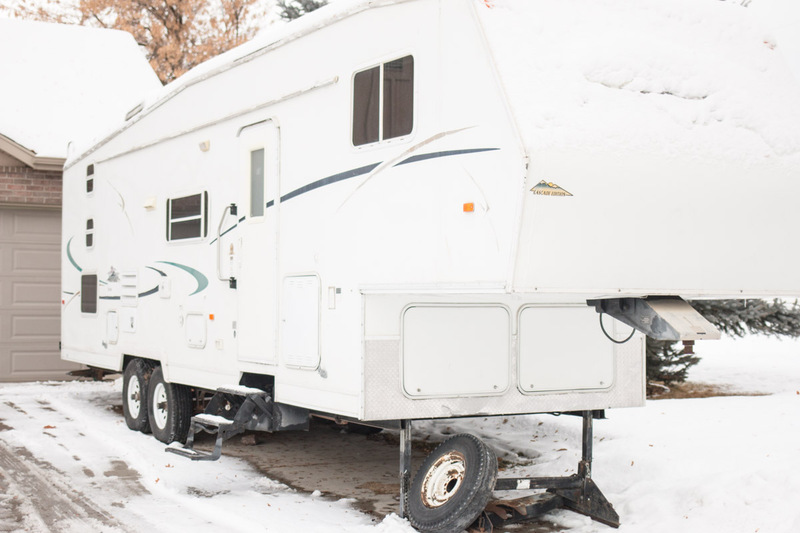 Move into an RV on our property? Hmm. Why the heck not?! We’ve gone and bought the cheapest, dumpiest camper we could find that would fit enough sleeping bodies for us. I’m going to show you the unsightly scene we have before us, just be glad you can’t smell it. I’m hanging on to hope that we can make this little home on wheels a comfortable, albeit small, place for us to live while we build our pole barn. Alright, let’s take a closer look at what I am lovingly going to refer to as “The TIDBITS mobile”. Our RV is a 2001 Nomad, 5th wheel trailer, with one slide out. We estimate putting in a couple thousand dollars into the full renovation, and are hoping to sell it in the end for much more than that. So calculating what we will save on rent and what we hope to sell it for in the end, we should come out ahead several thousands which we will certainly need for the pole barn. The person we bought it from mentioned that he got it from a lady, who was much like a hoarder and had lived in it for a time. While he pulled truckloads of stuff out, and attempted to fix it up, he got tired of it. He began to replace the flooring, but didn’t do a great job of it. The most important things we needed were enough sleeping quarters for our 4 kids and us. 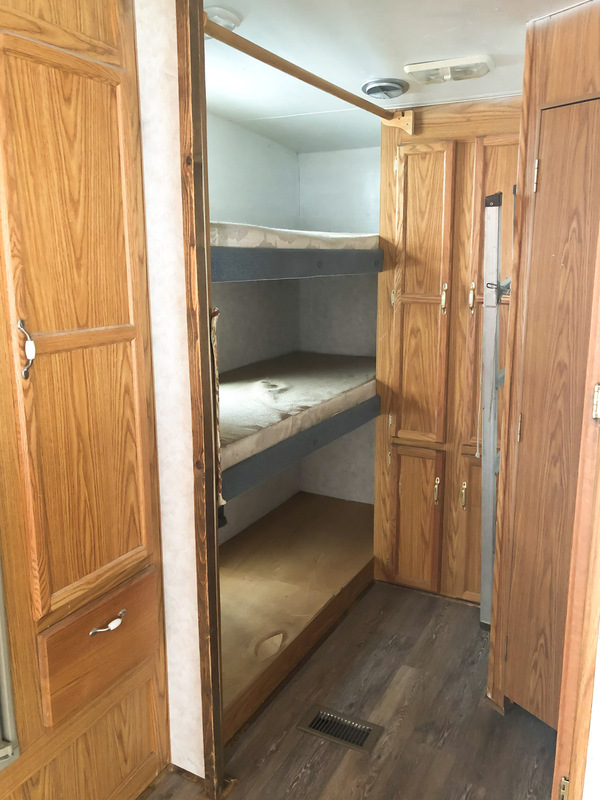 This RV has 3 bunks, and we will be building a trundle like bed/couch to make room for all of them. The bathroom is small and disgusting. The master room is up the stairs, in a cozy little spot that Kevin can’t even stand up straight in. We need to rework this slide out section to fit enough seating and dining for all 6 of us, and I have some DIY plans for that. The kitchen is . . . . well . . . in need of some love. And maybe we need to take a minute to just admire the lovely color palette and wallpaper. Now time is of the essence for this project, so we have actually begun to rip things out already and prep it for the renovation. The couch, the table, the nasty carpet, some upper cupboards, appliances, countertops, window treatments and much more has got to go. The amount of mouse droppings we found would make anybody shudder. I’m hoping by the time we are done with it, the TIDBITS mobile will look completely different. While brainstorming, here are some of the plans we have for this RV. Rather than buy a sofa, we are looking at building our own custom couch with cushions, much like these images. 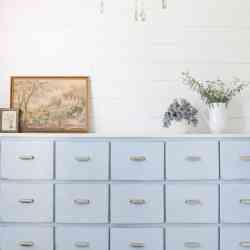 Then my husband will add the trundle like bed into the design. The other kids will get a much improved cozy bunk area. 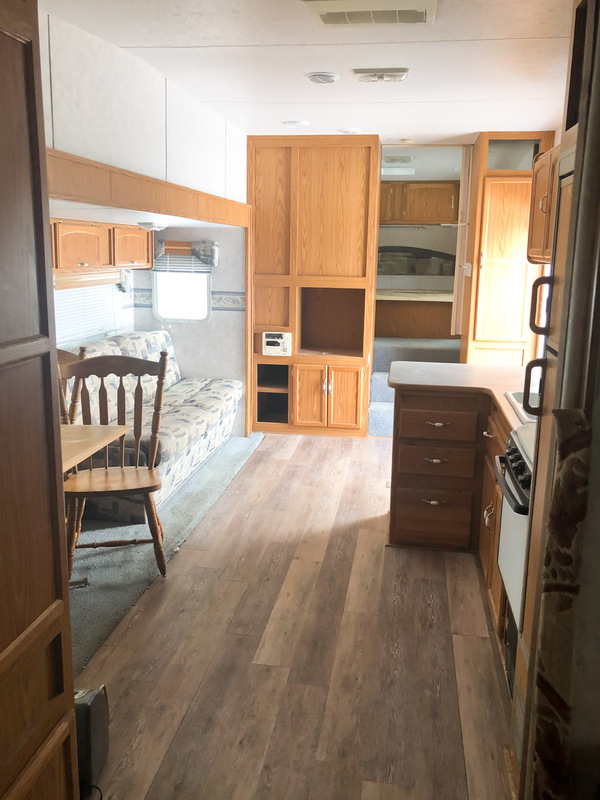 You can see in my inspiration images how much better the RV could look with some major improvements to the walls, such as paint, new wallpaper and some detailed trim work. We will upgrade what appliances we can, sinks, faucets, lighting, etc. 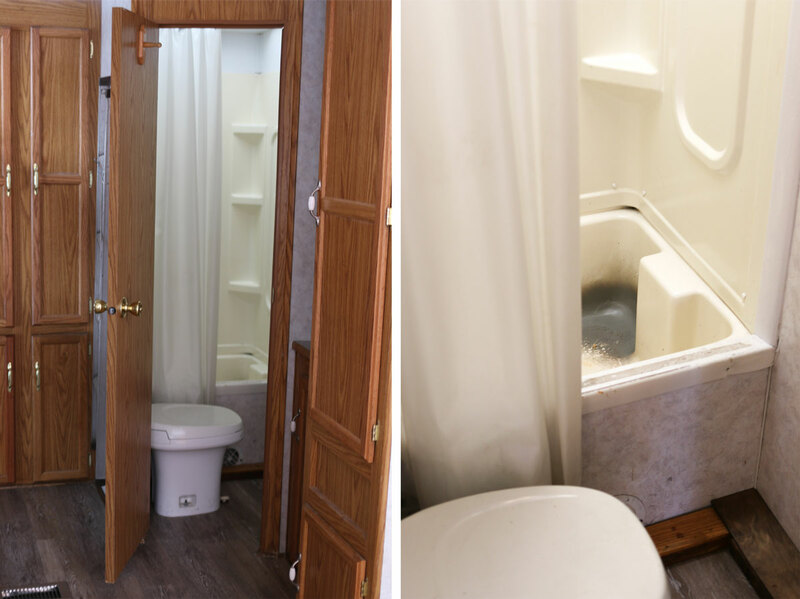 Go ahead and check out my RV Pinterest board, which will help you catch a glimpse of the hidden potential that lies in the TIDBITS mobile. I hope you’ll enjoy following along on our next crazy adventure, which I’m hoping doesn’t end up making me a crazy person. 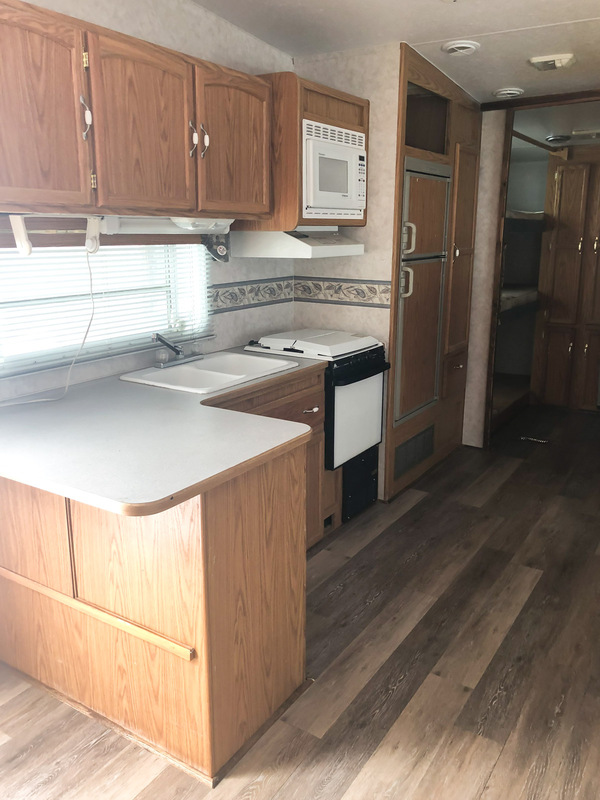 I’d love to hear what you think, and let me know if you have any experience in the RV world whether that is living in one for a time or renovating. I would love all the suggestions I could get! Thank you so much for reading and watching and be sure to subscribe to my channel and follow me along for more inspiration for do-it-yourself living. Brave! Good for you and your family!! For you to choose staying together is the first thing I think is wonderful! Sounds like an adventure that you will never forget. You will make fun memories and grow closer as a family through this. How exciting!! There is so much to look forward to, and I’m happy for you!! Can’t wait to see the renovations! If anyone can make it beautiful, it’s definitely you and your husband!! God bless you! Borderline crazy too, right? 😉 . And I sure hope we can make it pretty! I’ve got a lot of ideas and just hoping it works out in the end! As you know I think your family is ideal so I know with much praying and seeking God’s wisdom you will come through it all gloriously and know that you have people like me who love and pray for you and your family so follow your dreams. Sweet Daisy! I am so grateful to have your prayers and love! It’s readers like you that keep me going on the hard days! Sending prayers and gratitude back at ya! It’s a great idea and I am so happy, excited and loving this for y’all! Thank you Ramona! Time will tell if it really is a great idea! I mean, 6 people in an RV! Yikes! How very exciting!!!!! Be sure to wrap your water pipes and do some under pining and insulate the floor! May need to put some on under side of the RV!!! Try spending the night, “think dry run,”; which will help you see what you need!!! Be sure to make pull out drawers under your built in dining area! Huge help!! Be sure to get down comforters for everyone! They smash down to nothing!!! Oh great suggestions and thank you for the prayers! That means so much to me. I screen shot your comment and sent it to the hubs. So helpful! Thank you! When my house burned down last year, my hubby and I spent 7 months living in our RV while we rebuilt. This allowed us to stay on our property during that process. While our kids are grown and out of the house, we have two dogs-the large one is 140 lbs -which made things more interesting 😂 my advice is buy a screened canopy and bbq grill. The screened canopy allowed us to sort of “add a room” for rainy or buggy days. We could have friends over for dinner or just have room to work on projects in it. We have an extensive garden and I cook and can a lot so the grill and large patio table let me continue to do this all summer. Luckily our garage didn’t burn so we had a large freezer because the small RV one didn’t hold much! It was a bit of an adventure going from February to September living in it! Good luck! Oh, my heart goes out to you just hearing about this fire! What a thing you have endured! The kids have begged for a puppy and I thought all this land it would be good to have one, but not while in an RV! The hubs was trying to convince me that we needed to get a screened canopy. He’ll be grateful to hear of your assurances! I’m glad we will be close to my moms house still so I can always escape there when we need a break. Glad to hear that it’s possible and so grateful for your thoughts! Thanks funny! I’m the one more likely to say “no way”, but hubby was very convincing on this one. Let’s hope it is a good idea in the end! If not, I’ll send the RV over to you to try. You sound more enthusiastic 😉 . Haha! That makes total sense, Fyi does not the couch fold down or out into a bed? And the table usually folds down also. If you have main swerer pipes on your property you can hook it up to that so your not having to constantly always dump your waste water and holding tank. Depending on the size of oven you can bbq if it’s gas , you can wrap roast in foil and they will cook very well, use a shallow pan to be able to lift the roast out of the oven orgas grill. If you do dishes, use a tub inside if your sink then when done take the tub outside and dump , do that so you won’t be filing up your waste water tank .you might need a cooler get a yeti yes it is pricey, but it will keep things cold longer and not having to replace ice as often. Just remember this is only temporary and adventure. It will also bring you closer as a couple and a family!!! Pamela dear! So many good tips! You made me start a RV living endurance plan note page 😉 . Thank you so very much and I do hope it brings us closer rather than driving us all crazy!! Very smart, i know the children are very excited and it is wonderful to keep you all together. This a journey that will have lots of memories, some bad but, i think mostly good. Praying and waiting for next post. Hi Cami. 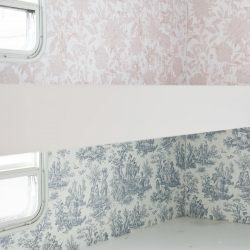 Check out mobilehomeliving.org for great ideas and how-to do remodeling. I will be purchasing a manufactured home in the near future and have book marked many of their suggestions. Hope you find it useful. I think your “project” is a wonderful idea. I completely understand wanting to be together. I think it’s a super idea that will allow you to pursue your dreams and all. Crazy? maybe. But definitely the brave (and smart) thing to do. 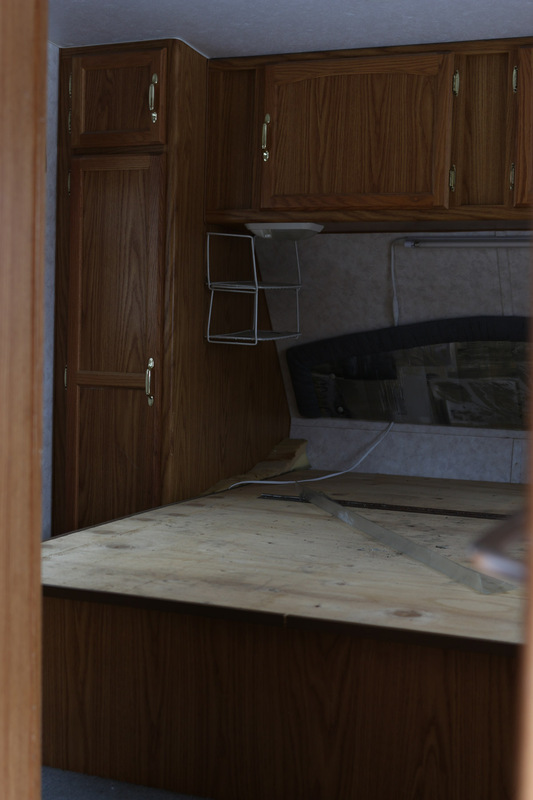 I’m excited to follow along as you turn Tidbits Mobile into a beautiful, tiny home. I think your children will find it a grand adventure! 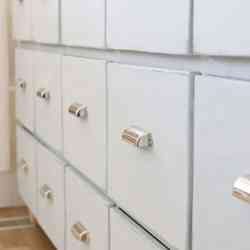 I think it is a good idea and you may want to keep it after when you see how much it looks. Enjoy and remember to let the man do the repair work. Breath ever so often. This is so doable! My husband and I just finished our dream home in Colorado and lived in a camper on the property for 15 months. We were able to save rent money and buy most of our lighting and plumbing fixtures throughout that time, as I found good deals, and our mortgage was reduced. We also contributed a bunch of sweat equity to save money. An added bonus was that when we wanted to take a trip to “the big city” ( we’re in a pretty remote area), we just hitched up and went! All the best on your new adventure! You have got this!!! You will make this so pretty and so cute and cozy that any one of us would love to live there too! I cannot wait to follow along with the progress. Your long term plan is wonderful and I am excited for you and your family. With God’s Blessings for all of this, go get it!!! what an exciting adventure. And i am so looking forward to your sharing it with us. 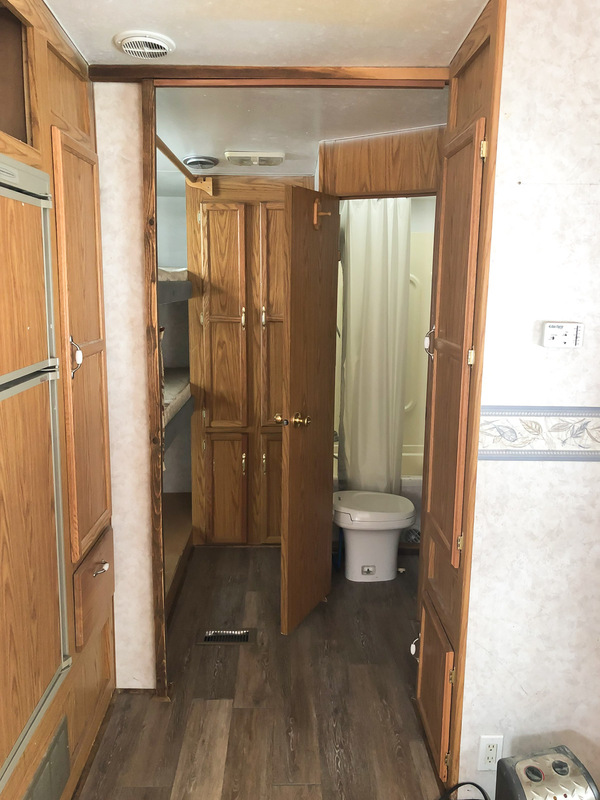 I wish you luck and I know you wil, make this camper your home and it will be lovely..can’t wait to see the finished product..I have made our camper our own and it is our summer place..I didn’t go to the extent you will be doing but we love our cozy happy place..have fun..
My husband is a contractor. We have built or remodeled more times than I want to count in our 45 years of marriage. We started building our first house before our wedding. Our daughter started high school living in a camper, using a light on an extension cord to get ready. Her brother was sleeping in the newly built garage. We have lived in a trailer more than once. We recently retired and are now remodeling a lake house built in the 40’s. Life is an adventure. 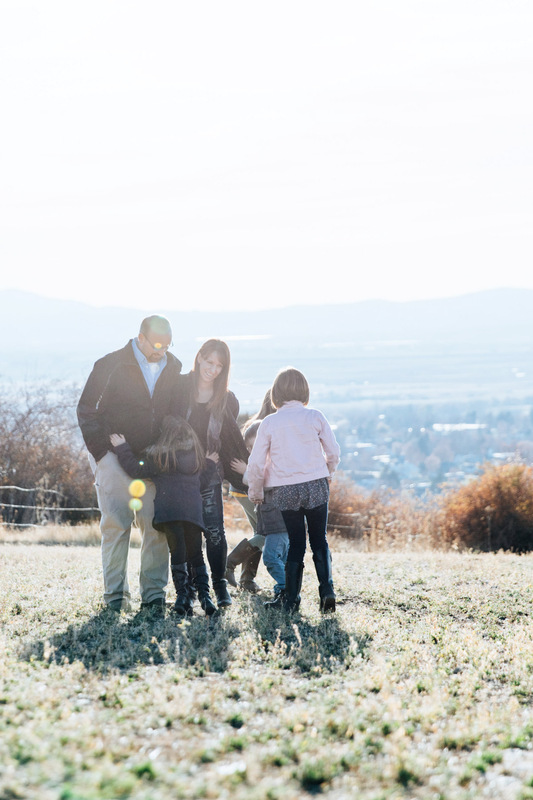 Your famiy will have great memories of doing this together. Keep God at the center of your project. Keep a sense of humor and walk your gorgeous property when you need time to yourself. Looking forward to watching your progress. I am so excited for you guys! Easy for me to say, on the sideline seeing you guys do all the heavy work! But, as I’ve said before your united front is what is going to propel you forward thru all the phases of this construction work. Hi Brave Woman! Love the idea and the reasons behind it. I was wondering if you might be able to get some media coverage, or a segment on a show that could help pay for some of this. (Using some sponsors and such, for the products you use). It would probably be worth more than what you get for blogging. Just a thought to help with the finances and the potential fun! Hi! I am a new, excited, follower. 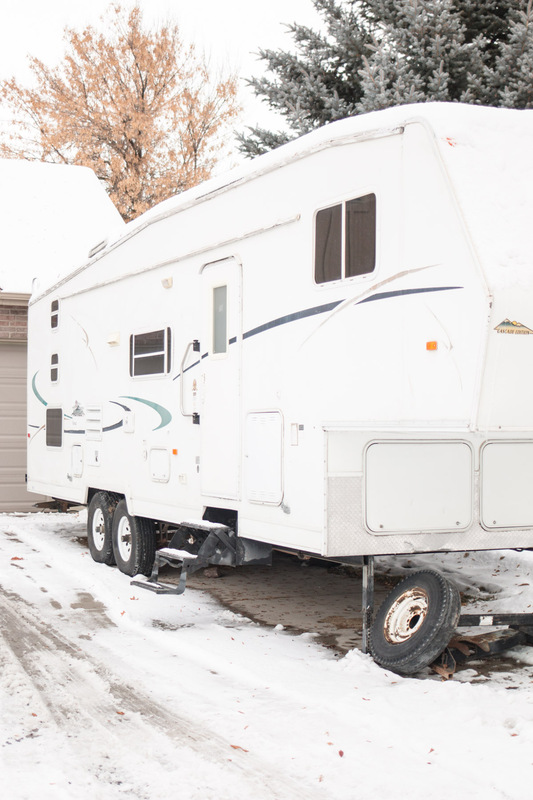 I lived in a 5th wheel for 9 months and was fine with it — though, we traveled. Also, with my 2 dogs. There’s an IG account, wish to heck I could remember which one, that is a family who did exactly what you all are doing. Challenging, but it worked!! You can do this!! We lived in a 5th wheel RV for 3 years. I know I could do it again. It really simplifies life. You have to be selective about what and how much you move in with you. Less is best. Cleaning is quick and easy. It is so worth the sacrifice and your family will become closer. I applaud your desire and determination to do this. Good luck! I think this is a fantastic idea and had some friends that successfully did it (there were 8 of them at the time!). I’m sure you’ll need to have some strategies in place to keep your sanity. But seeing your new home coming to life will surely help you to persevere! Looking forward to your RV updates. An RV remodel is on my bucket list. I know, I have a weird bucket list. Oh, this renovation is going to be so fun to watch! This is something I want to do someday. I’ll look forward to your updates.